When many people think of roller skating, they think of listening to music, typically from the past, and moving around a large wooden rink. Sometimes, these rinks are decorated, and the skaters have dressed up as well. However, this is not the only time that roller skating can be fun. There are actually competitive sports that involve roller skates. Whether someone is looking for a new sport to try or are just seeking a new challenge, here are three sports to try while wearing roller skates. Roller hockey is considered to be a rapidly growing sport. The basic idea is to take hockey off the ice and onto a roller rink. There are actually three different types of roller hockey in the United States: Hardball uses a hard ball made of rubber or cork and a curved cane. The Puck style uses a regular puck and hockey sticks, while North American uses hockey sticks and a softer ball. All three are still played in the United States and follow the general rules of regulation hockey. Many players today use inline skates, though some teams do use four-wheel skates. Artistic roller skating is a sport that is very similar to figure skating. There are categories for singles, groups, couples, dance, and show team. Each division has its own unique rules. Some categories allow for props to be used, others do not. Precision Team Skating, for example, does not allow props but requires the group to move as one and do specific movements. The Dance category focuses on technique and interpretation of the music. Several categories require specific moves to be used, while others do not. Roller derby is a game that tends to be played among women, though in 2017 more men were joining the leagues, making it a more gender-neutral sport. Roller derby pits two teams against each other and is divided into a bout. Each bout has five members of each team on the track at a time and involves them racing around the track until time is called. One of those members is the jammer. The team gets a point every time their blocker passes someone on the other team. However, the teams are not just trying to help their own jammer get more points, they are also trying to prevent the other jammer from getting through. 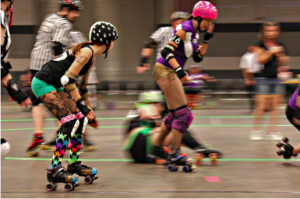 Roller derby can be an intense sport, but many think that it is fun enough to make up for that. A person trying any sport on roller or inline skates needs to have the correct equipment for that event. The skates used for artistic roller skating and roller hockey, for example, might not be the same. Luckily, companies like Riedell have a large variety of skates. Roller skating is not just an activity for people who want to take their time and glide around a ring, though that is a wonderful part of the sport. There are several sports that use skates, and these can be a lot of fun. Really, there is a roller skating activity for everyone.